Here's one of the new pieces I've been working on this week, after working on daytime assignments. I'm working my tail off trying to complete a few new pieces to auction off in the next coming week or so. All pieces will be sold as a way to raise money for donation to the National Wildlife Federation. Due to the horrific oil spill in the Gulf, many animals are dead, dying and need help. Our waters are now so badly damaged from this awful situation, it seems hopeless. Luckily, there are lots of wonderful people out there volunteering and donating what they can. The NWF is accepting donations for animals in crisis, the money will go directly to protecting wildlife and wild places impacted by the BP oil spill. If you aren't aware of how bad this spill actually is, I strongly advise you to do a little more investigating. The videos and photos from the impact of the spill are enough to make you cry. love it Steph...and is that a self portrait? Hi , where is the FOLLOW icon? I'd like to follow your blog but..how to? Oh, come onnnn.. I wasn't intending for you to post that! That was my private message for you, Buscema. 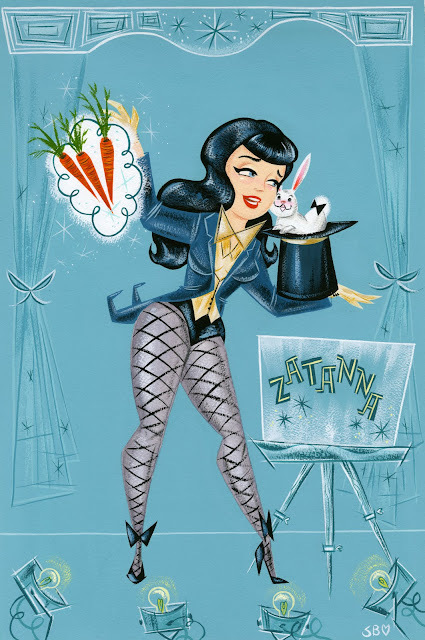 I only wanted YOU to know that I think your beautiful Zatanna painting is crap. Hahaha ;)! We're both still mad that we missed TCAF, btw! Will we see you at SDCC?? I'm an Illustrator and painter from New York with a serious love for music, 1950's kitsch, old monster movies and vintage children's books. My days are spent in the studio working on cover illustrations, comic art, picture books and paintings for exhibition. © 2010 Stephanie Buscema. All Artwork Copyright Stephanie Buscema. Headers and subheads are set in Hooligan. Made possible by Typekit and Veer.